This is the easiest thing in the world to forget if , like me, you’ve spent a lifetime walking into rooms without giving your footwear a second thought. 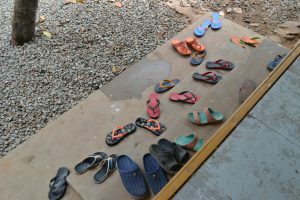 I keep walking into a room and then shooting out again to take my shoes off – I can see now why everyone wears flip-flops; I don’t imagine there’s much of a market for Doc Martens in Cambodia. Another surprise was the communal, compulsory toothbrushing session, with a good old spit-out into the gravel afterwards. The class set of toothbrushes is kept in the classroom and the teacher doles out the toothpaste to each child in turn. According to the project manager, these children come from families teetering around the poverty threshold which is 2 US dollars a day per family, so toothbrushes are not very high on their list of priorities. The lesson I observed this morning was maths, and the children all got on with their work very sensibly. They are 11-12 years old, and their English isn’t too bad. But the afternoon class was quite a different matter. A much larger and more lively group, I didn’t dare take any photos in case I provoked a riot. They spent the lesson hitting each other with rulers and throwing pieces of paper around the classroom. The rooms are all open on three sides, so the children can’t be contained, and one boy disappeared and then returned with the hose from a vaccuum cleaner, presumably in a bit of weapon one upmanship, while the poor teacher struggled to make himself heard. It will be interesting to see how I fare with these horrors tomorrow when I teach my first ever art lesson. I just hope I don’t get an overwhelming urge to jab one of them in the eye with the end of a paintbrush.